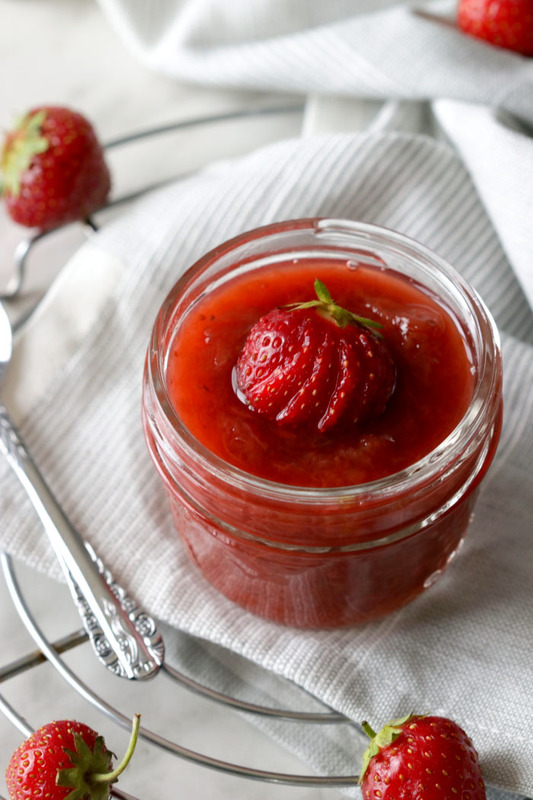 A jam lover’s joy, this Strawberry Rhubarb Jam is just as fun to make as it is to eat! Flavored with both the zest and juice of an orange and some freshly grated ginger for a little extra zing. When a pile of homegrown rhubarb literally landed at my feet…or rather my kitchen counter, I didn’t quite know what to do with it! I had loads of it! I’ve never baked or cooked with rhubarb before. It simply was not a vegetable I grew up with! So, I washed it and patted it dry…cut it into chunks and into the freezer it went. It sat on the top freezer drawer simply glaring at me each and every time I opened the freezer door. A constant reminder to use it before freezer burn set in. Since I had so much of the chopped stalks I decided it was time for some jamming! My first batch was all about the rhubarb and although it surpassed my expectations it was lacking that vibrant red color I had hoped for. I suppose this is to be expected when one’s rhubarb stalks are mostly light green in color with splashes of light pink and crimson red tips. But I must say that the taste was not impacted at all and the jam had this lovely golden hue much like apricot jam in color. It was total deliciousness and I would not hesitate to use the lighter green stalks again when jamming. Just the same, I still wanted that crimson red jam! Thankfully we are still in strawberry season here in Quebec, although it is tapering down as I type this. And that’s where these mid-season strawberries make their star appearance. In the second act of my jamming experience! I used a full one liter basket of Quebec’s own glossy red strawberries. They’re wonderfully sweet with exceptional flavor! And well worth the wait, especially if planning on canning for the winter season. 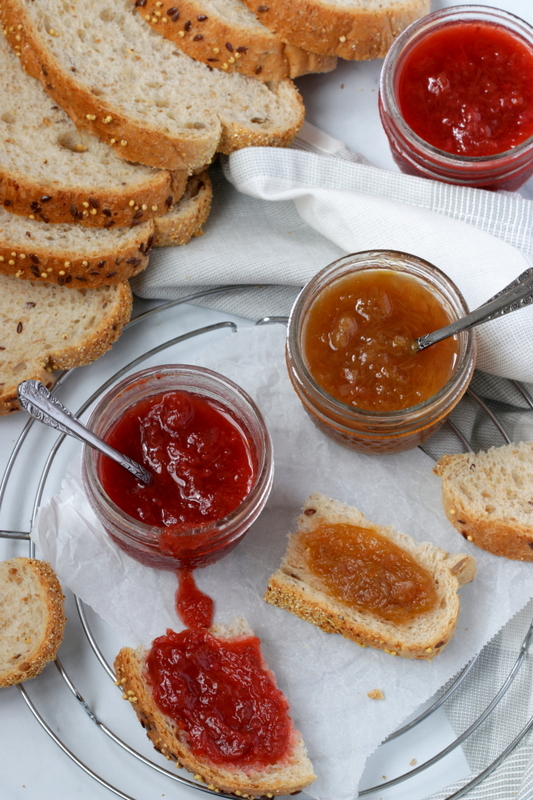 This recipe however does not require any canning experience and its a no pectin jam. But you’ll definitely need to use sterilized jars and lids. It will keep refrigerated up to one month, if it lasts that long! Otherwise you can extend its shelf life by freezing the jam in small portion containers up to 6 months. But for maximum flavor I never freeze beyond three months. 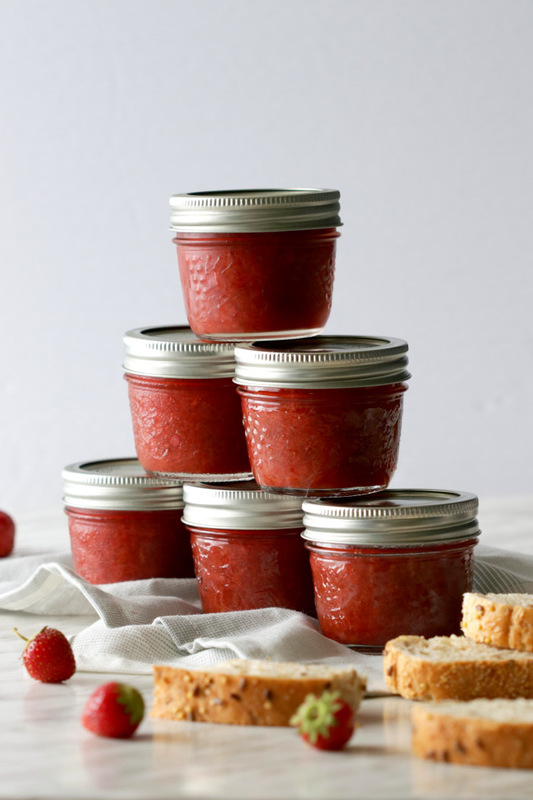 Enjoy this easy to make Strawberry Rhubarb Jam on toast, dolloped over vanilla ice-cream or simply in any other of your favorite recipes! Place all the ingredients in a large sized pot and bring the mixture to a boil. Once it starts to boil, lower the heat down to medium-low and allow to simmer for 45 minutes to 1 hour while stirring occasionally. You'll know its ready when it reaches the consistency of applesauce and will thicken a little more as it cools. 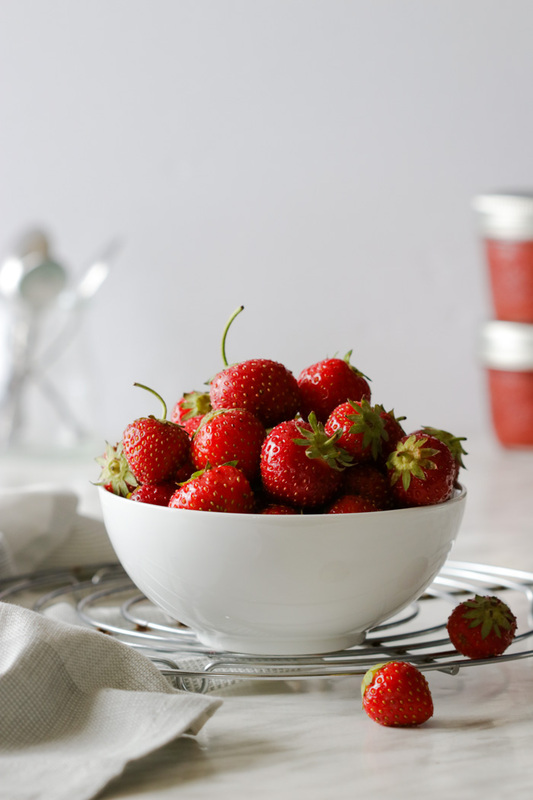 Ladle the jam into the sterile jars and seal them with the sterile lids and rings. Keep refrigerated if consuming within a month or freeze the jam in freezer containers or freezer bags for longer shelf life. If your freezing the jam do note that flavor and quality declines when frozen too long. I would definitely consume frozen jam within 3 months for maximum flavor. 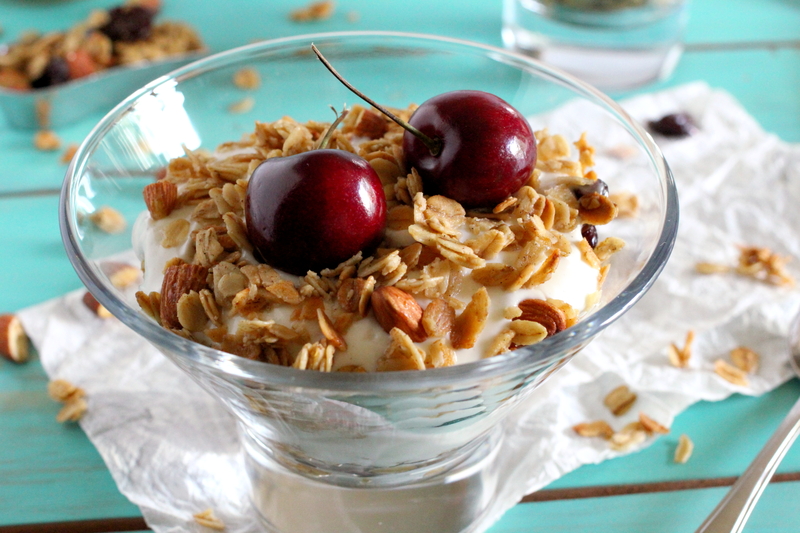 Cherry Granola Greek Yogurt Parfait makes a perfect breakfast alternative and is equally delicious as a dessert or simply an anytime snack. This parfait has a lovely contrast in textures from the smooth velvety soft yogurt which is scented with cardamom and sweetened with honey to the crunchy bites of almond and cherry granola. Greek yogurt has got to be my new favorite type of yogurt, since testing and sampling recipes from the Yogurt Every Day Cookbook. I’ve grown to love its thick creaminess which I find has the same soft and luscious consistency of a Dairy Queen ice-cream. Before that, the only kind of yogurt one would find in my house was the sweetened fruit filled one. You all the know the one I’m referring to. The kind packed with sweetened fruit at the bottom and topped with plain yogurt which you’d stir together just before devouring it. My absolute favorite was the cherry yogurt! This Cherry Granola Greek Yogurt Parfait is partially inspired by Hubert Cormier’s Yogurt Every Day Cookbook and my favorite flavored yogurt. Have you ever made your own granola? Homemade granola is far healthier then the store bought variety, not only because its sweetened with honey, a natural sweetener but also because you get to control the amount of sweetness used. Its super easy to make and the best part…you can mix and match the flavors and also add your favorite dried fruits or nuts. I’ve scented my granola with cardamon to compliment the cardamom in the yogurt mix and added a touch of almond extract with the more usual vanilla extract. I also went with dried cherries since we’re still in cherry season but only added them in after the baking time because I didn’t want my dried fruit brick hard. It’s important to let them cool completely before breaking them apart and storing so that they retain their crunchiness. However, at my house they really don’t last past the second day. You’ll only need approximately one cup of granola to make this layered yogurt parfait and the rest can be enjoyed as a snack. Try dividing the remaining granola in small individual ziplock bags for some fun and easy, grab-and-go snacks which kids will love. I’ve topped my granola yogurt parfait with fresh cherries as a pretty visual appeal but that’s really entirely optional! 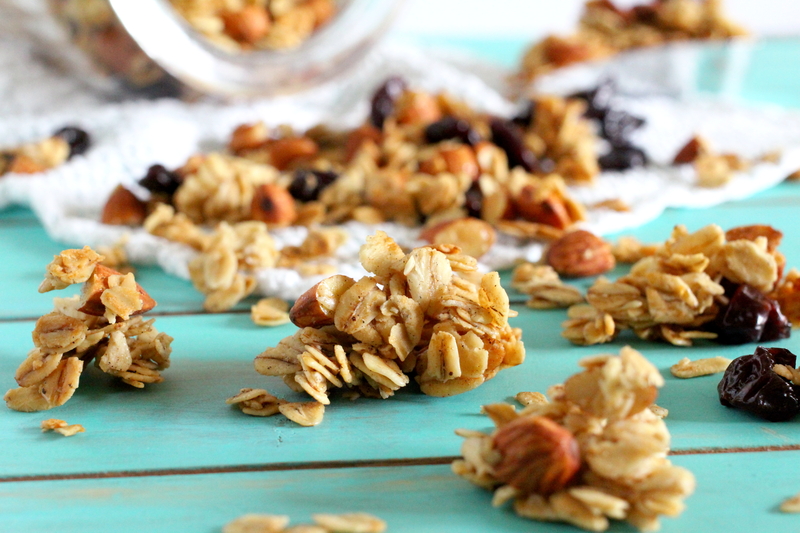 With very little fuss and a whole lot of flavor…there is much to love with this granola! In a medium sized bowl, stir together the rolled oats, almonds, cardamon and salt. In a separate small bowl place the melted coconut oil, honey, vanilla and almond extracts then stir to combine. Pour the coconut mixture over the rolled oats mixture and stir well until all ingredients are combined. Spread the mixture on the prepared baking sheet in one single layer. After the first 5 minutes, give the granola a good stir. Return to the oven and bake an additional 10 to 15 minutes or until golden brown. Remove the granola from the oven. Scatter the dried cherries over the granola and allow to cool completely before breaking into clusters and storing. Reserve approximately 1 cup of granola for the yogurt parfait. Store the remaining granola in an air tight container. In a small bowl stir together the yogurt, cardamom and honey. Layer 4 teaspoons of granola in each of 2 decorative glasses. Top with 3 tablespoons of yogurt mixture. Repeat with a second layer of granola and yogurt then sprinkle the tops with more granola. Garnish with fresh cherries if desired. 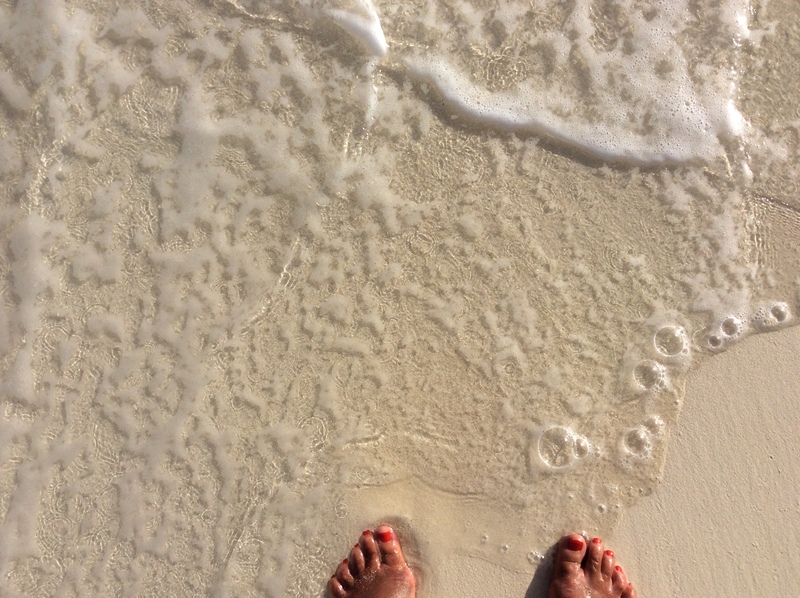 Having just returned from the white sandy beaches and crystal clear waters of Cayo Santa Maria, I find myself to be…still in a holiday mode. Cayo Santa Maria is one of the many islands of Cuba, just off its’ north central coast and lined with beautiful, luxurious, all inclusive resorts. A typical breakfast for me was a plateful of their exotic fruits, usually consisting of pineapple, papaya and the most delicious and sweet tasting mangoes that I have ever laid eyes on. We soon came to realize that the early bird gets the mango! They disappeared that quickly! First opportunity I had on arriving back home was in visiting the local Farmer’s Market, where I went a little teensy, weensy overboard with the purchase of fresh fruits…how can one resist these gorgeous fruits, right! Aside from the mangoes, pineapple and papaya, there were juicy strawberries and raspberries. Gadelles du Quebec, sweet, aromatic clusters of pink currants. Kiwis, figs and passion fruit. I did also purchase a coconut but alas, I could not pry it open and now it sits on my kitchen counter till hubby (muscle man) gets home. 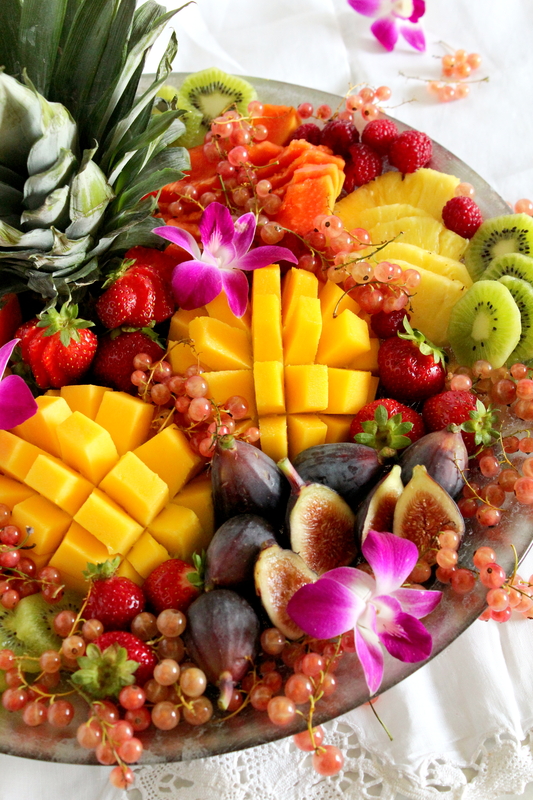 A well platted fruit platter makes a stunning centerpiece and a lovely alternative to sweet desserts. It’s just wonderful served as is or complimented with condiments such as honey, maple syrup, caramel and chocolate sauce. Which now brings me to the dilemma of what to do with all this delicious fruit, aside from feeding the whole neighborhood that is! 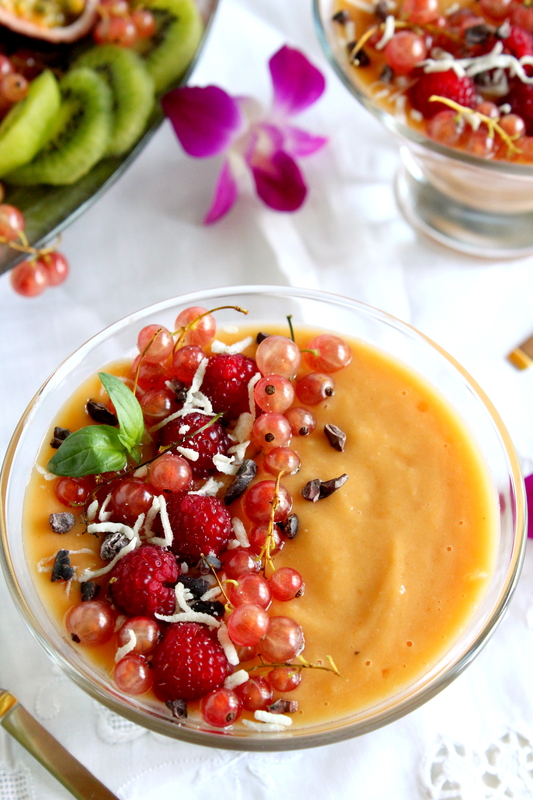 Hence the inspiration for this Valentin Tropical Fruit Smoothie. Valentin, being the name of our resort. Fruit smoothies are really quite simple to put together, making them an easy go to breakfast choice. You can use any fruit you have on hand. For a creamier consistency add a frozen banana and your favorite nut butter for an extra protein kick. To thin the smoothie I used almond milk because that is what I had on hand but you can also use any non dairy milk, even coconut water or fruit juice. Go ahead and give it a little extra love by topping your fruit smoothie with more fruit, a sprinkling of coconut, or even nuts and seeds. I am sure it will become a favorite morning ritual. A mix of banana, mango, papaya and pineapple blended together with almond milk and peanut butter to form a refreshing tropical fruit smoothie. Pour into small serving bowls. Mornings have just gotten better with these Blueberry Lemon Scones. They are made with tangy buttermilk, scented with grated lemon peel and drizzled with a lemony glaze. Several months ago my daughter gifted me with a Ricardo Magazine subscription. The English edition (much anticipated by moi) launched last September and is packed full of gorgeous photography, mouth watering recipes, plus tips and tricks to help new beginners in the kitchen. For those not familiar with Ricardo Magazine, it is Canada’s one and only National Food Magazine. A treasure trove of recipes for all foodies, whether you are a seasoned cook or just beginning, you are bound to find some inspiring meal ideas. Glancing through the magazine, what caught my eye was not the Strawberry and Lemon Cake that graced the front cover nor the Hot Fudge Sundae with Caramel Popcorn (although I may try the latter next), but rather these heavenly buttermilk Blueberry Scones. Scones come in a wide variety of shapes and unlike other recipes where the blueberries are mixed in with the scone batter, here the blueberries are rolled delicately into the dough. These scones are crispy around the edges and have a soft, dense interior bursting with the sweetness of the blueberries. What I did differently, merely as a personnel preference, is I added lemon zest to the batter and drizzled the scones with a tangy lemon glaze. They are so insanely delicious and will have you doing the happy dance in your kitchen! 🙂 Warning though, they are extremely addictive. Tip: They are best served immediately, however, they can be frozen for about a month. Simply thaw and reheat in a 350* oven for about 10 minutes. As an added note to save on time in the morning, combine all the dry ingredients with the frozen grated butter in a bowl and keep this mixture in your freezer. In the morning remove the mixture from the freezer and continue on with the recipe. I tested the recipe using cold butter and another time with grated frozen butter and I have to say I prefer the frozen butter. It simply rendered the scones more airy on the inside but both ways were delicious! Preheat the oven to 425F (210C). In a large bowl, whisk together the flour, sugar, baking powder, baking soda, salt and grated lemon peel. Grate the frozen butter and toss it into the flour mixture. Use a pastry cutter or two knives to work in the butter just until the mixture resembles coarse crumbs. Make a well in the center and pour in one cup of buttermilk. With a rubber spatula, gently toss together the mixture just until it appears moistened. Turn out the dough on a floured surface. Dust a rolling pin with flour and roll out your dough into a 16 inch square. Scatter the blueberries over the dough. Dust your hands with flour and start rolling the dough into a long cylinder. Use a pastry cutter to help loosen the dough from the work surface if needed. Once your dough is completely rolled out, press it slightly down to a thickness of about 1 and 1/4 inches while maintaining 16 inches in length. Next, cut the dough into 7 equal rectangles and then cut each rectangle diagonally in half to form a triangle. Place 7 triangle pieces onto each prepared baking sheet. Brush each scone with the remaining buttermilk and sprinkle generously with the coarse sugar. Bake one sheet at a time, with the rack on the highest position, for 18 minutes or until the blueberry lemon scones are a gorgeous golden brown. 🙂 Let cool. The end pieces puffed up a little higher because the blueberries mostly centered in the middle when rolling. Next time I will spread them out much more towards the edges of the dough. However, it mostly certainly did not take away from the taste of these addictive scones. Yields 14 scones. Crespella with Nutella, thin Italian pancakes very similar to french crepes. They can be rolled up, folded or even stacked together with either a savory or sweet filling. For all the nutella lovers who are looking for yet another way to enjoy their favorite chocolate hazelnut spread, you are going to love this recipe because of the ease in which it comes together. You can turn just a few simple ingredients into something so delicious and spectacular looking that will surely please every member of your family. You don’t need a special crepe pan to make this crespella, any 12 inch oven proof pan will do. Here the gooey, creamy chocolate spread is drizzled over an oven baked crespella, with a tender middle and crispy edges and no flipping required! This recipe is my favorite way to use up Quebec strawberries which are exquisitely sweet and full of flavor. Hurry up and get yours though because the strawberry season in Quebec is winding down. In a pinch you can substitute your favorite berries, bananas or better yet a combination of both. Crespella with Nutella, thin Italian pancakes similar to french crepes. They can be rolled up, folded or stacked together with a savoury or sweet filling. Place a 12 inch ovenproof pan in the middle of the oven and preheat oven to 450*F.
In a medium sized bowl, combine the flour, eggs, sugar, vanilla extract, salt, milk and whisk all ingredients together. When the oven reaches 450*F add the butter to your pan and heat in the oven till the butter turns golden, for about 1 minute. Pour the batter into the pan and bake for about 20 to 25 minutes. The crespella will puff up and look golden brown when ready. While the crespella bakes in the oven, whisk together the nutella and 3 tablespoon of milk until smooth. The nutella sauce should have a nice drizzling consistency, if not simply add a little more milk.